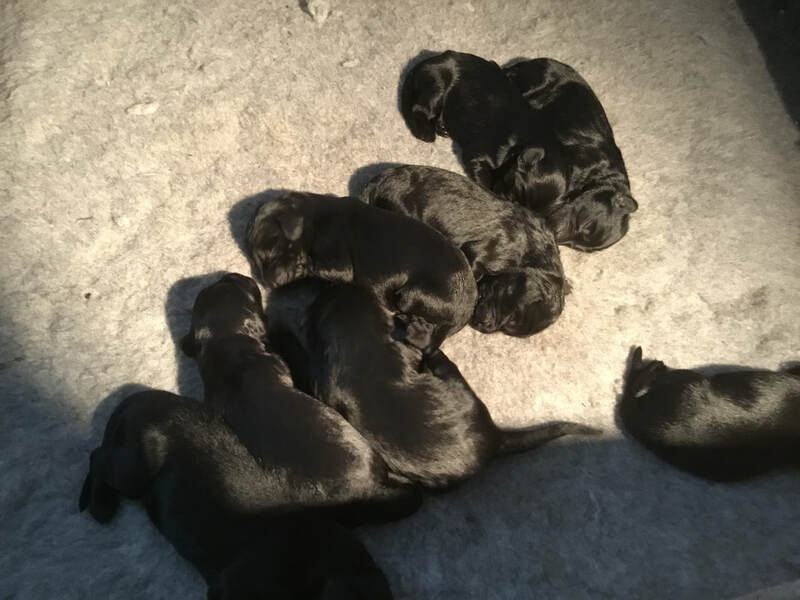 The puppies are growing fast now and are a hungry bunch, so sleep is limited! They are are tiny alarms clocks prone to going off every two hours and the noise they make is enough to wake the neighbourhood! 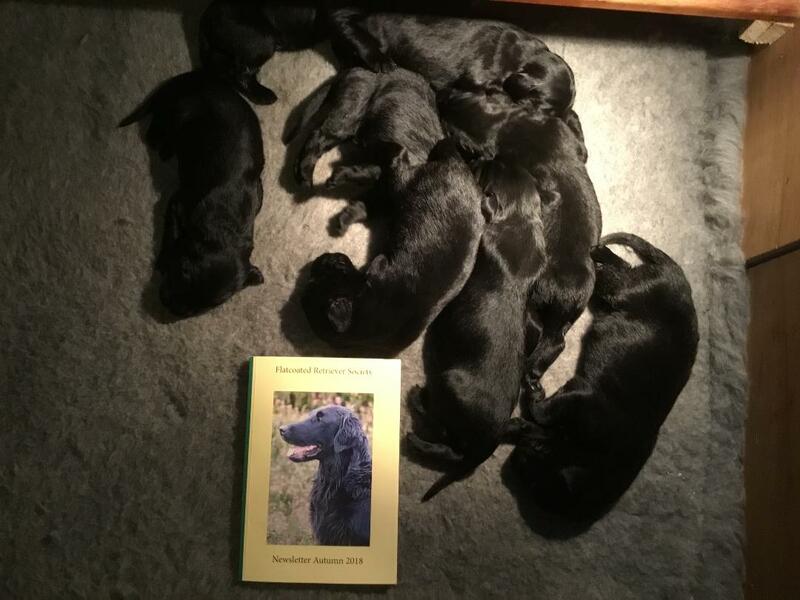 Comparing them to the Flatcoated Retriever Society newsletter which is A5 size gives you some idea of their current growth. This was taken on the 5th. 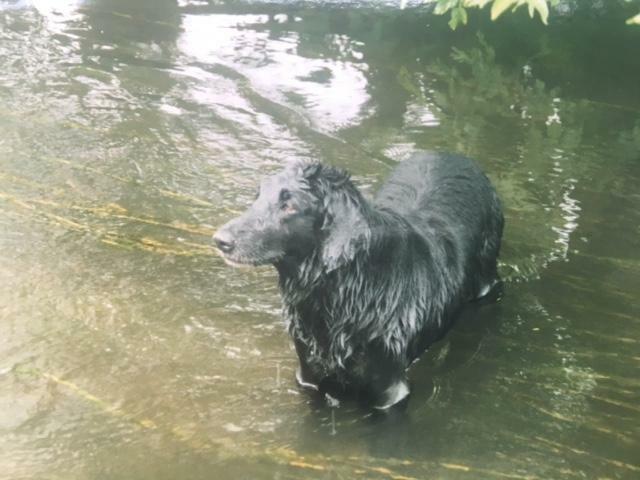 Thinking that perhaps not everyone is a member of the Flatcoated Retriever Society I thought I would picture them with a copy of the Metro newspaper which is a tabloid newspaper in the UK. This picture was taken on the 6th and they look like they grew overnight! 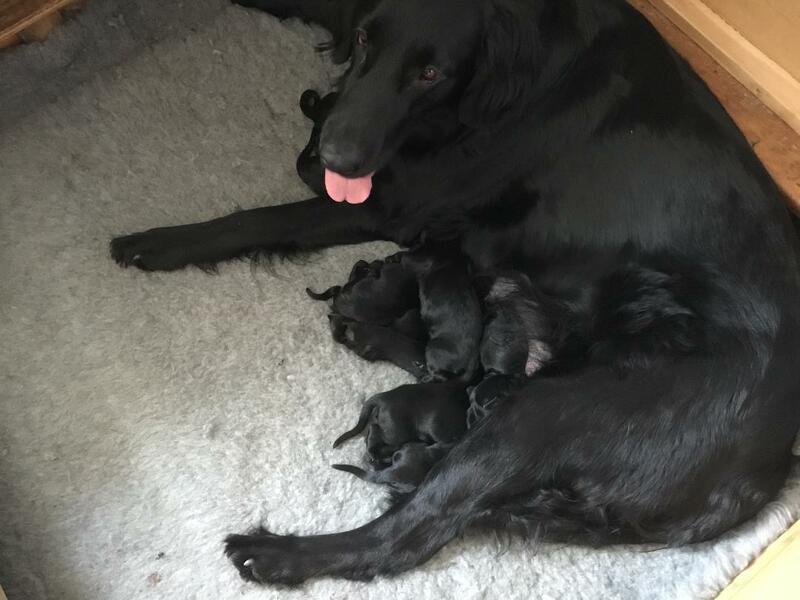 The puppies appear to have two mothers! 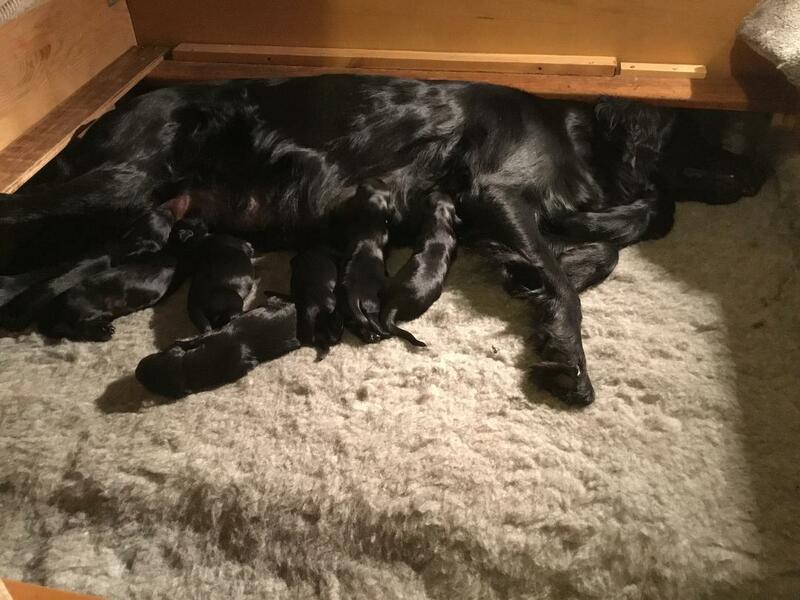 Alice their grandmother really wants to be involved and Miss Chief their mother doesn't seem to be bothered as it was Miss who took the puppies to Alice's bed, last night, and I was lucky to have my ipad handy to take the picture when I discovered them all together. Every opportunity and Alice is in the puppy pen so we have to keep getting her out! She spends a lot of time lying by the puppy pen and likes to stick her head in the box to check on them. 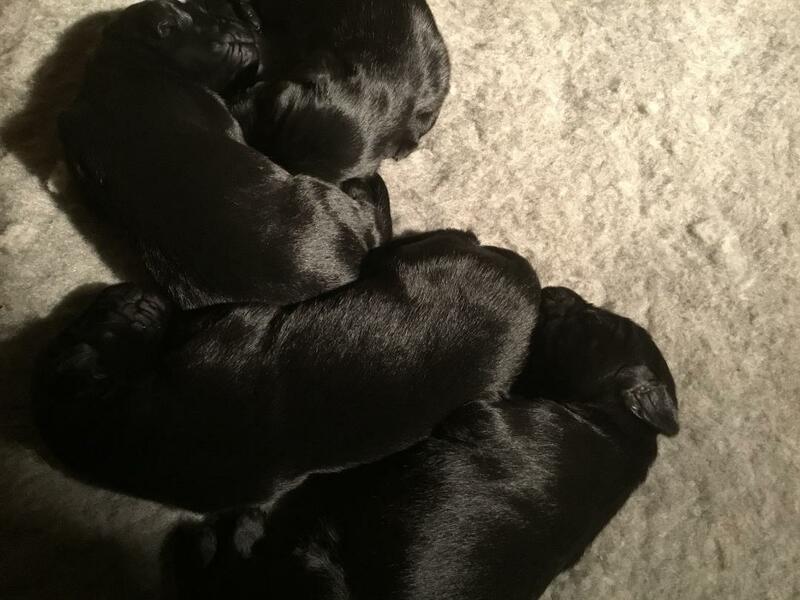 Although the litter is very even by today there is one puppy (first born) who has become quite the larger version of his two smaller siblings. 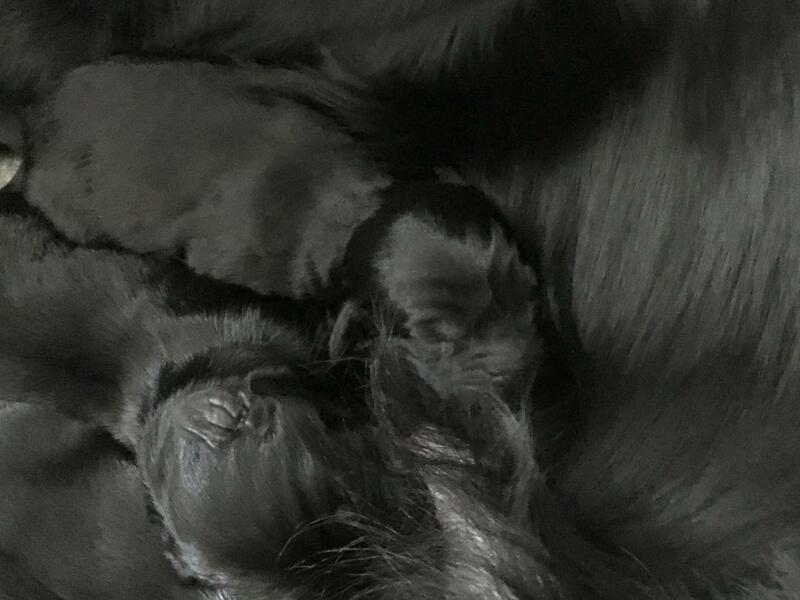 The two smaller siblings were the last two born and are mini versions of their brother perfectly in proportion for their size. I couldn't resist taking this picture as they were cuddled up together. April 2nd ... More relatives! As the puppies are still very small this is a good time to explore the pedigree a bit more, and meet their ancestors. 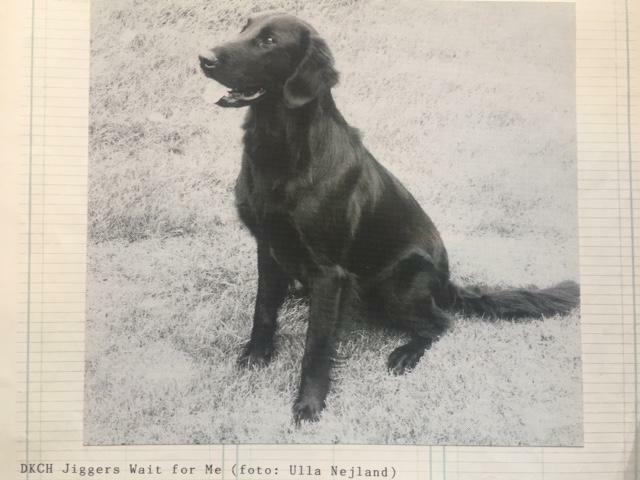 Above is DK CH Jiggers Wait for Me, a dual champion which means he was a champion of the field and the show ring. A truly handsome dog. Above is Hovhills Sa Her Ska Det Va and on the left is Tarncourt Little Jupiter. 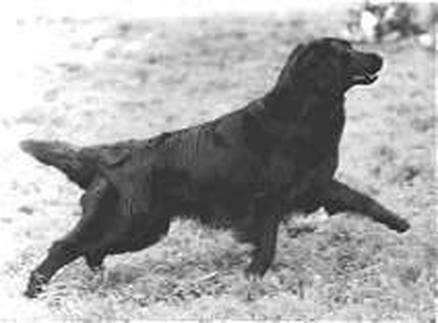 Tarncourt is a well known working dog line and appears a few times in the pups pedigree. 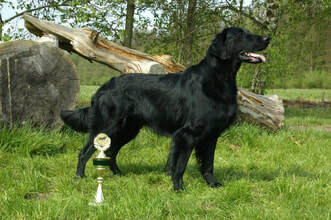 Above is an action shot of DK CH Albert and next to him is DK Br CH jiggers Tarka Cheata both are dual champions. Finally I am managing to catch up on the life and times of the puppies. Daily photos and note taking has been as much as I have been able to manage as the puppies grow and develop. I promise to get my act together now!!! 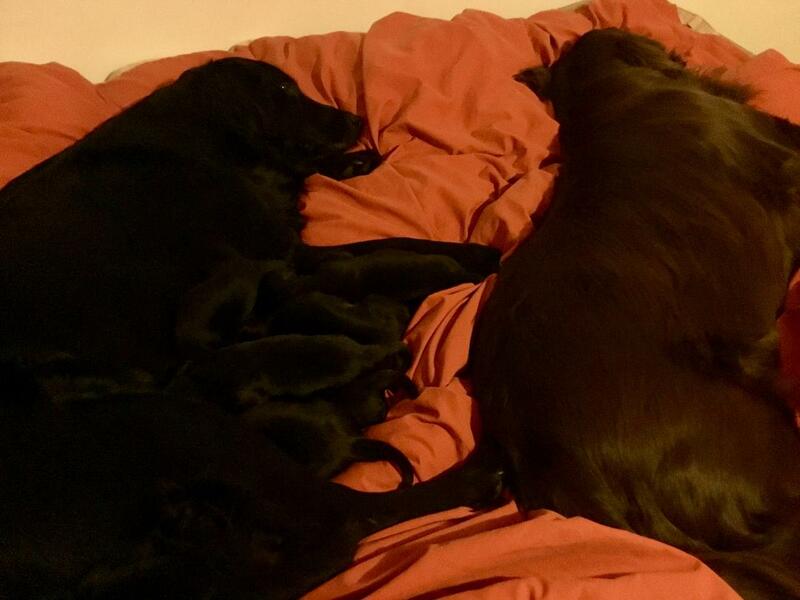 Cuddling up to each other and sleeping, something they will do a little less of in the next few days! 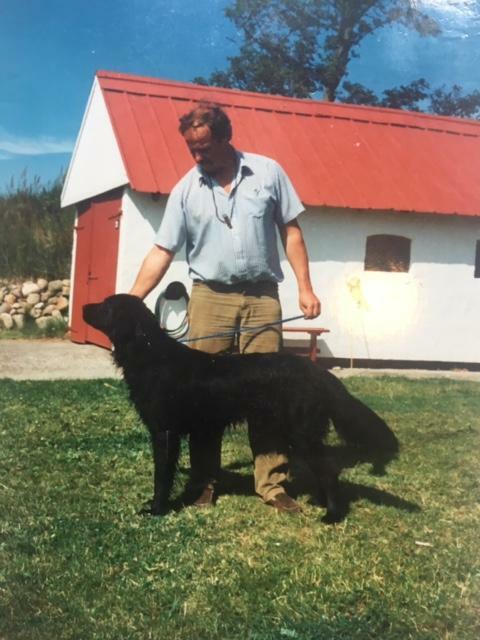 Feltis Von Rethwischohh is the grandfather of the puppies, and father of Miss Chief. 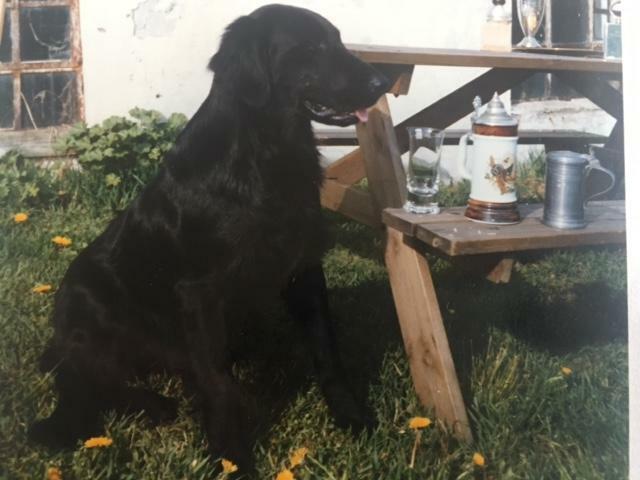 He is was a good working dog who lived a very long life. 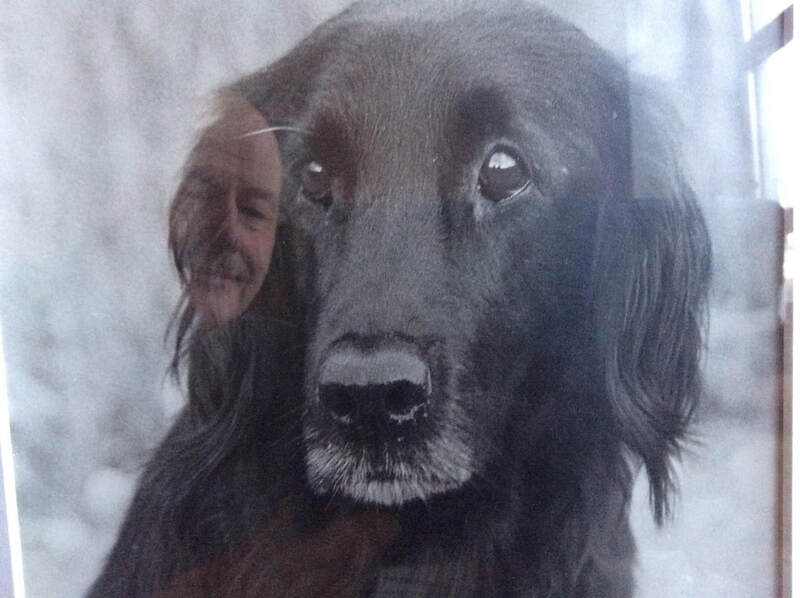 This picture is of Falcons mother Jiggers Tarka Lovely Rita and the face caught in the reflection is that of Mr Poul Ronnow who breeds the Jiggers line of working flatcoats in Denmark. Rita has the most lovely dark eyes. Like all dogs of this line she was a working girl picking up regularly. 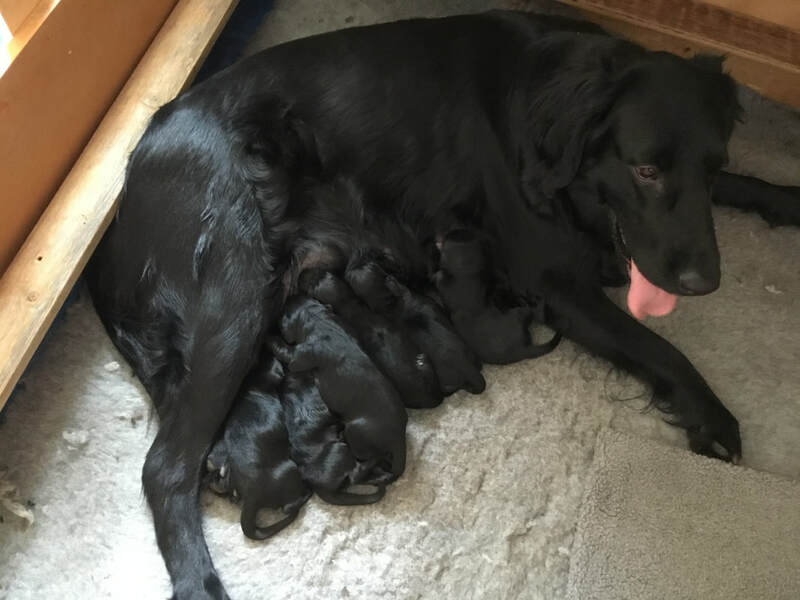 Last picture for today is of the puppies and their Mum, they are growing at an amazing rate! Their coats gleam and look as though they are polished. 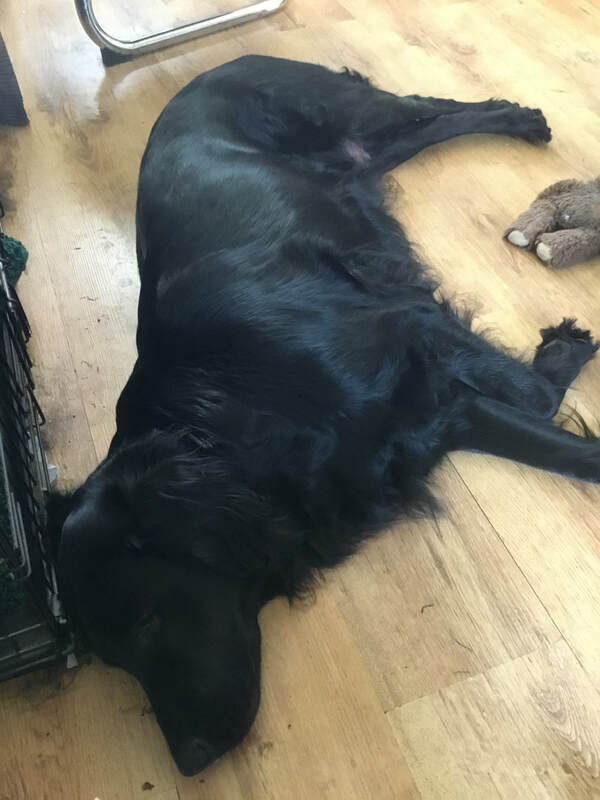 Alice got the sudden urge to dig a den when the pups were about 3/4 days old, and Missy has done the exact same thin since late yesterday she has been digging a den. It is very chilly standing in the garden in your nightwear trying to get a dog out of a giant hole. 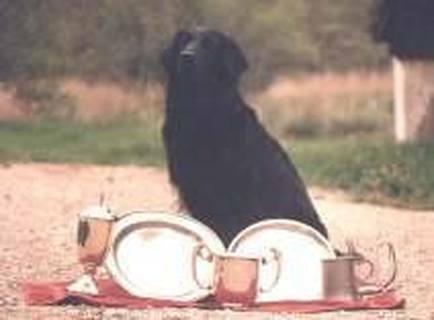 At least when Alice had her pups it was not frosty in June, but this morning at 5am the frost was white over the garden and I was shivering! Today Missy decided the babies were old enough for her to leave them for a few minutes at a time. Time to chill out and escape the horde! In some churches in the UK when the register is signed the father of the groom escorts the mother of the bride to the vestry to witness the register being signed. So I thought it would be fun to post Falcons father and Miss Chiefs mother together. While the puppies are tiny it is always a good opportunity to look at the family tree. 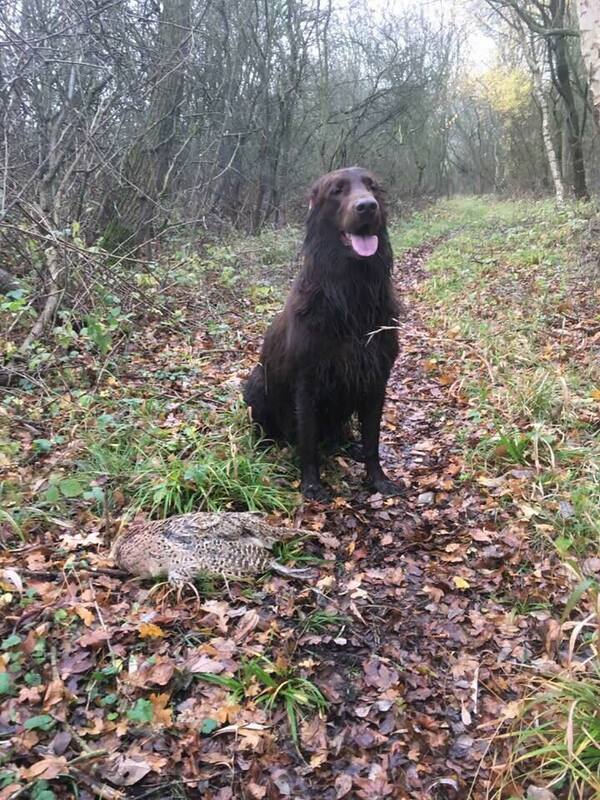 All the dogs in the pedigree work on shoots and in some cases other dog sports and learn to work with their owners to create a strong bond of partnership. Alice the grandmother of the puppies has competed in the show ring in breed and keepers classes, obedience, rally and agilty. more of these two later. Everyone well settled into the daily routine and very chilled out right now.